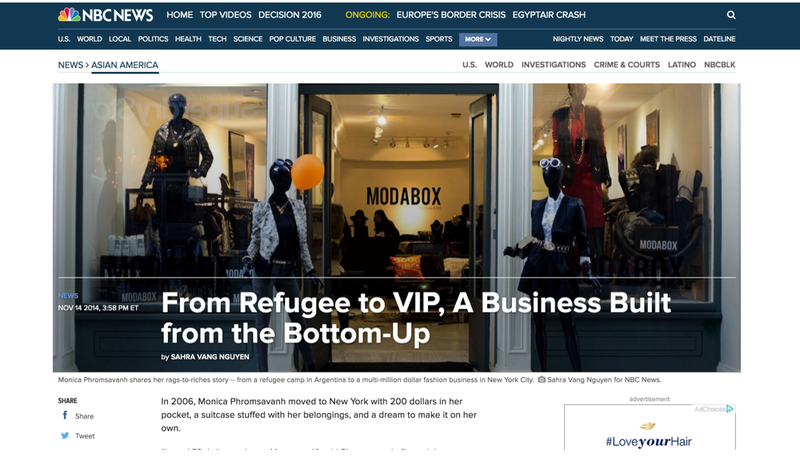 PHROMSAVANH'S STORY HAS GAINED COUNTLESS MEDIA ATTENTION, INCLUDING ENTREPRENEUR MAGAZINE, NBC NEWS, HUFFINGTON POST AND MORE. Behind the Bell at NRF by Nasdaq Podcast Interview. For Monica Phromsavanh, bootstrapping as an entrepreneur doesn’t seem like a major sacrifice, considering the potential upside of her business. In 2006, Monica Phromsavanh moved to New York with 200 dollars in her pocket, a suitcase stuffed with her belongings, and a dream to make it on her own.Yet within years of setting foot in the city, she'd found her niche, built a business from scratch, and generated $3 million in revenue by its third year. New York Fashion Week. ModaBox & Russell Simmons Collaboration on FW Runway Show collection.